Find chord charts for guitar, bass, mandolin, banjo, etc. Look up any scale, any tuning. 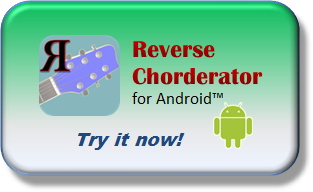 This app does a "reverse" chord lookup. You specify how the chord is played, and I'll tell you what the chord is called. Click on the strings and frets that are played in your chord. For an open string, click just to the left of the fretboard. Possible names for the chord will be displayed below. Visit the Chord Designer discussion forum. Flash Player is required for audio.